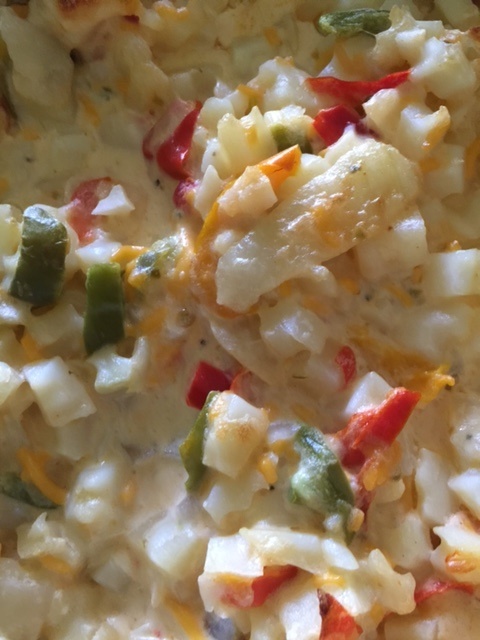 Microwave hash browns and peppers/onions in microwave safe bowl (sprinkle with small amount of water) until completely tender. Drain completely, leaving in bowl. Mix sour cream, both cheeses and mayo in separate bowl. Combine both bowls and pour into 1 1/2 quart baking dish. Bake at 350 for 30 minutes, stirring once half way through. Season to taste with salt and pepper. I like Perfect Pinch Bell Pepper and Roasted Garlic.